Originally if you walked into a military bar and placed your challenge coin on the bar then everyone else had to produce their coins or buy everyone in the bar a drink. If everyone produced their coin, you had to buy the bar a round. In martial arts the meaning is somewhat different. The coin is typically given to yudansha (dan rank holders) as a reminder of their achievement and a symbol of their attainment of true advanced student status. 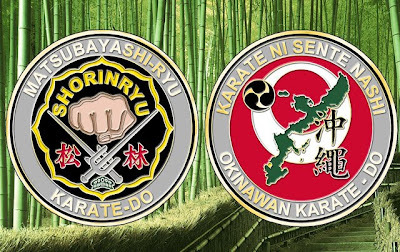 When given to dojo mudansha non-dan rank holders), the coin represented an acknowledgement of that student's potential to excel in the dojo and the art. Regardless of rank, the challenge coin serves as a easily hidden reminder to the practitioner they ARE a martial arts practitioner and are expected to conform to the highest of morale and ethical standards. This is best embodied in the slogan "Karate ni sente nashi" or "There is no first attack in karate." This does not actually mean for you to allow the other person to strike first but, as Nagamine Hanshi explained it. "Don't be there." Don't be where trouble might start. If you're not there then there is no danger of you having to strike first. These polished brass metal coins each come in an individual PVC packet and are finished in full color with an epoxy coating to preserve the paint. The coin is 1 1/2 inches in diameter and 2.9 mm thick. This limited edition coins are in-stock and now available for $16.50 each Just click on the PayPal button below. (U.S. postage is free! - Contact me first if you are ordering from outside the United States). Adam Lanza now joins a growing list of disturbed American assassins which include other "notables" such as John Wayne Gacy, Jeffrey Dahlmer, Jared Loughner and James Holmes. It seems like the horror is only worsening but, as a country, we have a history of under-service to people suffering from the ravages of mental illness. That "head in the sand" attitude has been around for a very long time and we pay for it frequently. Let's avoid the quagmire of "Pro-Gun" versus "Anti-Gun" for minute. There has never been a case of any gun jumping off a store shelf and walking down to the nearest school, temple, polling place, etc. and shooting people. There has always been a deeply troubled mind behind the guns. When guns weren't available other means were used. On May 18, 1927, in Bath Township, MI, Andrew Kehoe used explosives to kill his wife, as well as 43 other people, including 38 children; and injuring 58 people in setting off bombs in what came to be known as the "Bath School Disaster." The only time he effectively used a firearm was when he shot the dynamite in his truck as a successful suicide. Eliminating guns, or knives, or baseball bats, machetes, swords, spears, etc. would be an ineffective stop-gap measure at best. Why? Because it does not address the true problem; the assailant, frequently the mentally ill assassin behind the horrors. The United Kingdom was highly successful in outlawing almost every type of firearm imaginable. And yes, their firearm murder rate did drop, however they now have a significant problem with murders/assaults involving edged weapons, i.e. knives. It is time we stop these needless, horrific, and pitiful killings. NO ONE can stop them all but I would suggest the following as a good first step. (1) Immediate funding for mental health counselors in every school (grade school, middle school, high school and colleges/universities. They would NOT be school counselors, instead their job would be to intervene early and help identify individuals with issues before they result to violence. (3) Education loan forgiveness for Mental Health Counselors (NOT Social Workers)! (4) Affordable psychotropic medications for individuals who need them. (5) Train school teachers (who wish the training and responsibility) in concealed weapons carry and close quarters handgun techniques. Sounds stupid, right? Remember when it sounded stupid to train Airline pilots to carry guns as well??? (7) Pass a federal law allowing certified Law Enforcement Officers (active and retired) to carry concealed weapons in any state of the union (not just where they work) to include airlines, buses and Amtrak. (8) Institute stringent training and certification guidelines, including a psychological evaluation, and then allow open carry to those who meet the new criteria. (9) Mandatory jail sentences for any "journalist" (Print or TV) who asks a family member of a murdered victim "What are you feeling right now?" You may not agree with me, but then that is what made American great: our right to disagree.